Watercolor, gold leaf, ink on paper, coloured steel. Hand drawn map of a simulated logarithmic scaled view of the south from London where the artist lives. 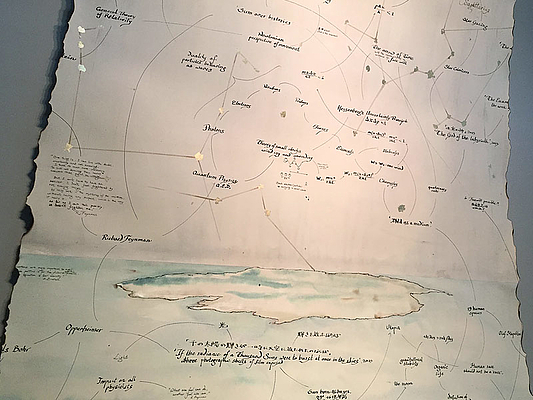 On the map, a copy of the mind map drawings of ideas, issues and historical facts that the artist has been drawing as a blueprint for the exhibition in his notebooks, is written with traditional western calligraphy, together with the names of the works exhibited in the exhibition room and their relation, connecting the very personal to the universal. Terra Australis is the name that was thought to exist in the south (Antarctica), that is now a quasi Utopian continent; not colonized by any particular country but shared between countries for research purposes under the Antactic Treatise, which excludes any military or commercial activities on the Antarctic continent.